17 years ago today, I thought my life had literally ended. I watched my beloved daddy, his vitals dropping, slipping away from us, and then he was gone. 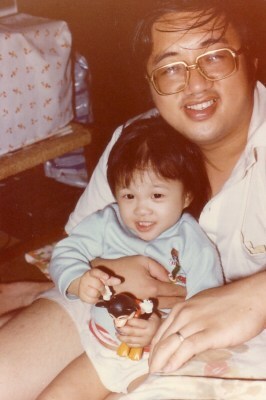 At each milestone of our lives (my family’s), I wished he was there to see us. For me personally, each time I stood on a stage performing, I wished so much that he was sitting in the front row, proud as ever, with his video-cam, recording so he could watch it over and over again at home (that’s really what he used to do!). When I got married, I wished both my parents walked me down the aisle. When Z was born, I imagined what daddy would have been like with him. I’ve mentioned previously (in a post on my old blog) that grief sneaks up on you all the time, when you’re least aware, but with Christ in my life, I know I can cope. Even through blurring tears I can still stand up and say YES…GOD WILL SEE ME THROUGH! Please understand that I didn’t post this so that I could gain sympathy from you, my dear reader, I do know you care for me I posted this because many still assume that Christians must be happy all the time, or worse, assume that God will always change our situations when we pray, and therefore treat God as our personal genie in a lamp, bowing to our every whim to keep us happy. It is true that God can change the situation, and grant our desires etc. however, ultimately, our faith is not about that, our faith is about trusting in God and relying on Him alone, knowing that His love for us is true. His plans are never to harm us. 17 years…17 years of “un-change” in my situation. The years come and go, the milestones are reached and passed, the anniversaries continue to come up, I cry another load of tears and think back to the times when daddy was around. Yet, even in the darkest hours of my soul, I know I will get through, because my future, my hope, is in Christ This hope alone is enough for me to keep going, keep smiling, but God makes sure I have the added comfort of His presence, daily, so that even my “keep going” is powered by His grace and might. And I look forward to the day when I will see daddy again, and thank God always, for giving us the faith to know this day WILL come. I hope that this little post will be a small source of encouragement to anyone out there experiencing any form of pain. Our situations may or may not change, but thank God He (His character & qualities) NEVER changes. He’ll see you through! Thanks Jen. Missing my Dad heaps and feeling extremely guilty for being so far away. I can’t wait to see him in two weeks time. Your post has reminded me to appreciate and cherish every moment no matter how fleeting, so as to never look back with regret, but to be grateful for precious time well spent. ~hugs~ Trinnerz. One thing I’ve always known about you is that you love love love your parents very much. I know how torn you felt when you were leaving, but I also remember that your dad was truly excited for you guys. You’re soooo right re: precious time well-spent.” You’re going to have such a great time with mom and dad when you’re back!! What a beautiful reflection and thanks for sharing it with us. It’s a reminder to cherish our loved ones and thank God for ever moment we get to share with them. It inspires me to reflect that though we often cannot see it in the midst of our trials and tribulations, God’s plan is always bigger and better than ours, and just like the footprint story, it’s during those troubled times, is when God’s carrying us. Be strong Jen, I’m praying for you. I completely understand how you feel, as I have the same experience as I watched my mum withered in her death bed succumbed to the ongoing torture of immobility and most of the time failing to articulate her inner feeling. I wished she could meet Z before she left. She didn’t. While our faith has not helped to make things more palatable, (as you might have noticed), it is however concerting to take note that it does help to position ourselves to face the challenge ahead of us. Over the years it does get better because I have slowly gotten to know God more bit by bit. He is the one who positions us so we have hope…standing with Christ and able to pray through Him. Thanks for reading and your love I am so privileged.